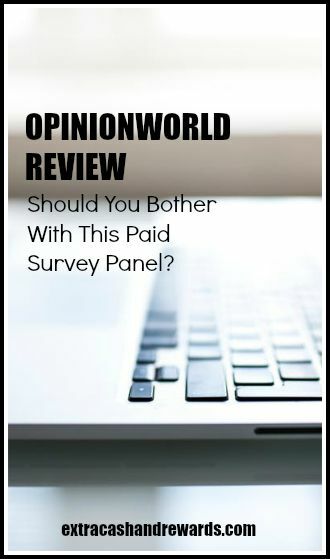 OpinionWorld Review - Should You Bother With This Survey Panel? Do you enjoy the extra cash that comes from taking surveys? Do you want to continue to add survey sites to your already growing list? Then OpinionWorld might be something for you to look into. OpinionWorld is a site which pays individuals or panelists to complete online surveys. The site is owned by Survey Sampling, a market research company, which is a company that has been around for a number of years. Opinion World works very similar to most other survey sites. You would just need to sign up with a legitimate email account, user name, and password. The email will be verified via a link in your inbox. Once you verify your email address, you will be redirected back to the site, where you create a basic user account with contact information. You are also screened for the types of surveys that you might qualify for. Most survey panelists state it takes between 10 to 15 minutes to create an account. Then the hard part is done, and you just wait for OpinionWorld to send you emails when there is a survey for you. How Much Money Can You Earn With OpinionWorld? The actual money you make depends on the number of surveys you qualify for and complete. Also, different surveys pay different amounts. Searching through the individual reviews of OpinionWorld and speaking with two people I know who use OpinionWorld, active users participate in 3 to 5 surveys a week and averaging $45 to $55 a month. I am sure that there are some doing better than that or worse than that. Can People Outside the US Join? Yes, people outside the US may participate in OpinionWorld surveys. At the bottom of their website, you'll see a list of 36 countries the panel is open to. How Much Money Do Panelists Need to Cash Out? After reaching $10, you may request the money to your PayPal account, or you may decide to use it for gift cards and other prizes. If you choose not to cash out, charitable donations are another option. Charitable donations are tax write-offs, so make sure you save those receipts. It doesn’t appear that they have a formal referral program. We have a list of extra cash sites with great referral programs if you're interested! Does OpinionWorld Have an App? OpinionWorld has an app called QuickThoughts™, available for both Android and iOS devices. What Do People Say About OpinionWorld? For the most part, I have received positive reviews from those I know who are taking surveys for OpinionWorld. Unfortunately, most of the reviews online are low with many individuals complaining about the terms and conditions stating that OpinionWorld could cancel their account at any time under their discretion. I have seen similar statements in other online survey sites’ terms and conditions. And apparently this does happen with OpinionWorld. How Do Interested Individuals Sign Up? If the links above don't work or you don't see your country listed above, you can visit their website directly to find the link for your country. Leisa Good is a certified career coach, VA, and owner of GBS Virtual Office Solutions. Her coaching specialties include entrepreneurs, small businesses, and work-at-homers who have become "stuck". She opened her virtual assistant practice part-time in 2006 when it was then named Gemstone Business Solutions and served the arts community. Changing its name to GBS Virtual Office Solutions in 2011, the business went on to serve a variety of businesses and entrepreneurs. Grab a copy of her latest e-book! This sounds like OpinionOutpost, which is also a great site to earn money from. You earn points for completing surveys that you qualify for and once you get 100 points, you can redeem them for $10, or you can choose from gift cards or charities. I’ve been a member for over 6 months now and have yet to be disappointed. I will definitely give OpinionWorld a try as well. @Jane – Awesome! Let us know what you think of Opinion World. I have found that Opinion World is NOT a decent way to earn even a small amount of cash. I have been a member for about a month and I’d say 90 percent of the surveys I’ve actually gotten to complete are for sweepstakes entries only. I tried sticking it out, hoping that I’d start seeing more surveys for points but I’m only up to 85 points and you need 1,000 to earn $10! !